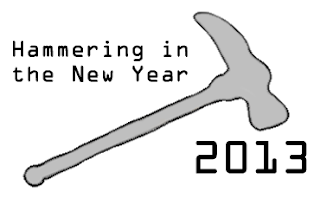 I'm running a 40k tournament to ring in 2013 called "Hammer in the New Year". This will be my first time putting on a tournament and I'm very excited to do it. When I floated the idea, I wasn't sure if there would be a big enough response, but my club quickly proved me wrong. Forgive my atrocious drawing skills. It'll be 1750 points on January 12th, 2013 at Game Parlor in Chantilly, VA. 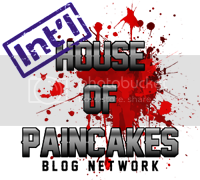 If you're interested in playing, please sign up on this forum post, which includes all the pertinent info. Spots are already filling up, which I am very pleased to see. And, if you have any advice for a tournament newbie, I'd be happy to have it! 1. Get the missions out early, so people can get a chance to understand them and make sure their lists mesh with the missions. 2. Test out your tournament tracking software ahead of time. Yes, smaller tournaments are easier, but a bit of work early makes tournament day problems easy to resolve or prevent them entirely. Or you can Excel it. Whatever way you want, give a test ahead of time, checking for avoiding past opponents and tables. I've got an excel sheet that does that if you are so inclined. Thank you very much, this is really helpful. I'm working out the missions already. If you could email that excel sheet to ashley@chickhammer.com I'd appreciate it. I hope I can get some more table space for you and the others. And here I thought I was going to have trouble getting 12.